In the Digambara Ascetism the monks are known as Muni or Muni Maharaj. They are organized in two different sanghas or groups which are known after the leader of the group or Acharya. The one who wants to renounce the world on religious grounds, begins to qualify successively for the 11 basic vows. He starts to control his behavior, to abstain from violence, to practice truth, to abstain from possession and attachment, and to live a life of a celibacy. Thus disciplined over a period of time, a person prepares for renunciation. He approaches an Acharya or the head of a group of monks and asks his permission for diksha, initiation. If the candidate is a grown-up person devoid of bodily faults and has acquired the consent of his nearest relatives-parents or wife-he is given permission to renounce the world. The community gets together in a festive atmosphere. He is given a new name which ends in such compounds as 'sagar'(means-ocean); or 'ananda' (means-joy); for example, 'shantisagar " (means-the ocean of peace) or 'vidyananda' (means-joy of knowledge). Among Digambara Ascetics three stages of monkhood can be distinguished. The monks of the first stage are called ksullaka and are permitted to wear two white clothes. Those of the second stage are ellaka and allowed to wear one loincloth. The monks of the final stage or the munis go naked. 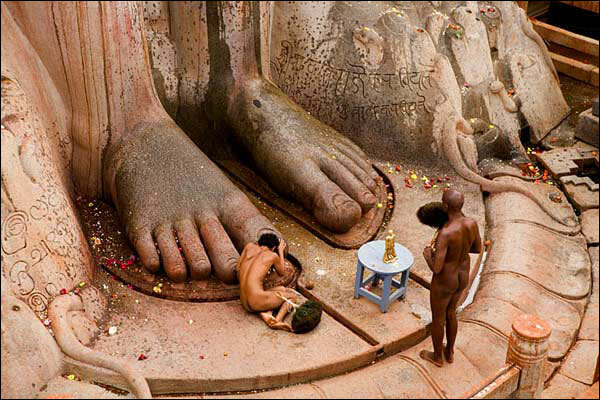 Also, different degrees of asceticism are expected during these three stages of monkhood. A ksullaka, for instance, is allowed to shave his head unlike the monks of the other two stages who have to pluck out the hair. A full monk eats once a day in standing posture, where as ksullaka may eat twice in sitting posture. A monk who has renounced the world is without a home and without possessions and therefore moves around completely naked. The only objects he is allowed to carry are a kamandalu, water-pot, and a pinchi, a fly-whisk of peacock feathers. To practice a strict and severe ascetic life, a monk always lives in the company of other monks. Normally a monk gets up before sunrise to carry out his daily routine. In an open field he finds a clean patch of ground devoid of insects, to perform his daily necessities. After washing his hands and feet (a monk is not allowed to take a bath) he comes back to his monastic chamber where he undertakes his daily samayika or study of texts and sits in meditation to identify his faults such as negligence in behavior towards living creatures. After this he goes to a nearby temple to perform chaityavandana or worship of the jina. On return he goes out for food to any of the shravakas (people of the Jain family) house for food. A monk keeps the thumb and the four fingers of his right hand joined together while resting on his shoulder. This is called ahara mudra. If he loses this posture on his way to the host-house-holder he is not supposed to eat on that day. This way the monk does not rest assured about the pleasure of obtaining food. A Digambara monk eats in standing posture from the hollow of his hands. The standing posture is prescribed because if a monk cannot stand anymore due to old age or illness the body is to be discarded by fasting till death (called as Salekhana). For eating or drinking he does not use any pots or pans. He eats the prescribed vegetarian food irrespective of preference. After having eaten, the monk goes back to the temple to practice samayika for at least 48 minutes in order to train his mind so that neither pain nor joy may affect him. If he then does not continue his journey on the same day he stays on and his admirers, the lay-community, gather around him to listen to his preaching. Afterwards the monks read together some scriptures or enter into religious discourses. The monks usually spend the night in a cell near the temples. they sleep on the 'floor'or on a flat wooden board, They take very little sleep and pass there nights in yoga practices . A monk should wander around in the dry season. He should not get used to one place, should be without a house and without any attachment. During the four monsoon months, however, he should stay at one place together with his Acharya, because at this time the growth and development of vegetation and insects are rapid. While wandering, a monk is not allowed to use any vehicle or boat. He has to walk barefoot. To cross rivers he walks along the bank till he finds a ford where he is able to cross over. But the water should not be deeper than the level of the knees. Also, he is not allowed to swim. All Digambara munis pluck out the hair four times a year. This is done mostly in front of the lay-community of the village. They pluck out the hair in bunches.Sometimes during this event, to stop bleeding sharavaks rub ashes on their head. In case a muni is too old or too weak for this, then sharavaks help him to pull out his hair. When a muni is sick, he does not eat food or drink any water. Devotees surrounding him sing devotional songs in loud chorus. After his death the body is placed in a sitting posture in a wooden palanquin named chakdo. It is then taken around in a procession and cremated on a sandalwood pyre.